Surf at Wells Beach, Maine. The first inhabitants of Wells – the indigenous Abenaki – called it Webhannet or “at the clear stream.” European settlers arrived in 1622, making Wells Maine’s third oldest town. At first, Wells served as the northeastern frontier of English settlement in the New World; after surviving years of attacks, the 1758 Siege of Louisbourg left the region firmly under British control. Over the next century, Wells grew as a farming, shipbuilding and fishing community. When the railroad arrived in the 1800s, Wells’ scenic seaside location made it a popular tourist destination — and its beautiful beaches and range of cultural, historical and recreational attractions still draw vacationers today. No trip to Wells would be complete without a visit to the Rachel Carson Wildlife Refuge. This 5,400-acre, coastal reserve encompasses a range of protected habitats, including salt marshes, sand dunes, rocky coastline, barrier beaches and tidal estuaries, as well as a significant portion of the Webhannet River’s watershed. The refuge is home to endangered and threatened species, like the piping plover and the New England cottontail, as well as hundreds of types of migratory and sea birds, fish, mammals and reptiles. The refuge is open year-round and contains several hiking trails. History buffs won’t want to miss the Division No. 9 Schoolhouse. Built in 1899, this single-classroom school served the Wells region for half a century. Today, this renovated school retains its original design, complete with student’s desks, a wood stove and slate blackboards. Visitors can tour the school spring through fall. Learn more about the Wells area at the Meetinghouse Museum. Set in a renovated Civil War-era church, the museum offers galleries and exhibits that bring the region’s past to light, as well as an extensive historical library. Experience the rich diversity of Maine crafting at Wells’ Summer Solstice Craft Shows. Every July, September and November, the region’s crafters come together to display their wares. You’ll find everything from wooden furniture to pottery, jewelry to paintings, quilts to woven baskets. In June, antiques vendors from across New England gather at Laudholm Farm for the annual Wells Antique Show and Sale. Explore wares from around the region such as early metal work, pottery, vintage jewelry, textiles, furniture and rare books. Each year in late August, the Wells Chili-Fest spices up the region. Chili cook-offs, tastings, food and craft vendors and live entertainment round out the festivities. The Southern Maine Christmas Parade lights up the snowy holiday season. Each year, the parade features floats, local performers, music, food and — of course — visits from Santa and his elves. For coastal hiking through protected habitat, visit the Wells National Estuarine Research Reserve. The reserve encompasses 2,250 acres and contains 7 miles of trails that cross through salt march, wetlands, beaches, forests and estuaries of the Webhannet, Little and Ogunquit Rivers. The reserve also contains several historic buildings, including the restored farmhouse at Laudholm, a saltwater farm. Spend a day picnicking and playing with the whole family at Wells Harbor Community Park. Set on the harbor amongst marshes and sand dunes, the park contains a gazebo, pavilion and playground, as well as bocce ball courts and horseshoe pits. Bring your road bike and ride along the Eastern Trail Alliance Bicycle Trails. Portions of the 65-mile Eastern Trail – part of the East Coast Greenway, recreational trails that connect South Portland to Kittery — run along Wells’ back roads. Wells Recreation Park offers 70 acres to explore, including tennis and basketball courts, soccer and baseball fields and playground. The park also has nature trails perfect for summer strolls or winter cross-country skiing or snowshoeing. 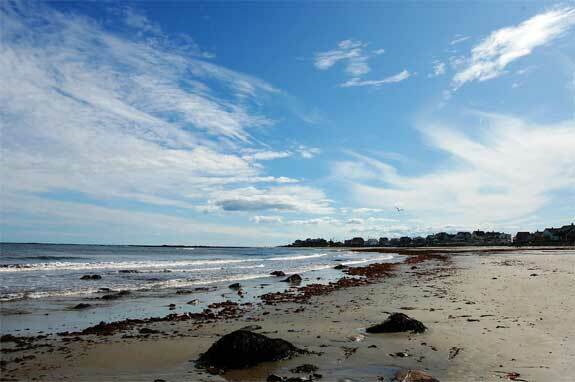 The town of Wells and its neighbors, Wells Beach and Moody, sit on miles of oceanfront. Wells Beach, Drake Island Beach and Crescent Beach are open to the public and are lifeguarded during the summer. Visitors can swim, sea kayak, sail, surf and fish. Walking is allowed on private Moody Beach. Wells has been a popular seaside resort destination for more than 100 years, so visitors can take their pick of accommodations. From private seafront cottages to cozy inns and guesthouses, you’ll find it in the Wells area. Wells is also home to a range of locally-owned motels, national chain hotels and big beach resorts, as well as several campgrounds that welcome tent or RV campers. Whether you’re craving a gourmet meal or just want to grab a quick bite on the go, Wells’ many restaurants and cafes will satisfy your appetite. The region’s many eateries offer everything from pizza to steaks, but many offer that don’t-miss Maine specialty: fresh seafood. Whether you chose a bucketful of clams or a steaming lobster pot, Wells many seafood restaurants deliver the freshest offerings straight from the Atlantic. Visit the following directories to find lodging, dining, attractions, shops, services and recreational activities in the Wells, Maine area.